HomeNorway Chess 2018Norway Chess 2018 Round Five: Caruana Takes Point From Karjakin. In the only decisive game of the round, pending World Championship Challenger, Caruana picks up the only point of the round -- against former Challenger, Karjakin. 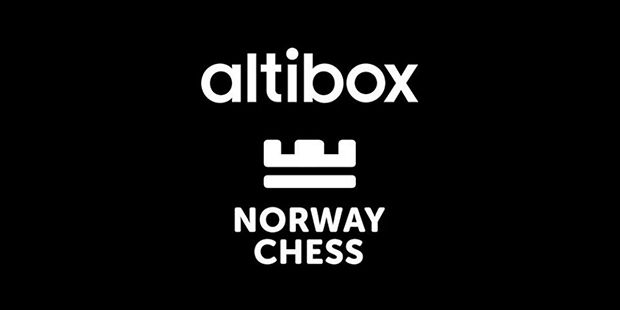 Round five of the 2018 edition of Norway Chess, was held in Stavanger on the 2nd of June. 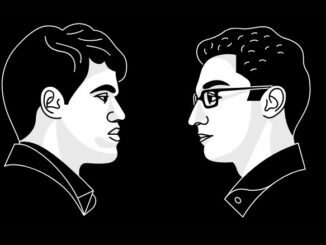 It saw all games drawn bar one, that of Fabiano Caruana against Sergey Karjakin. There was interest around this game, not least because it was the current challenger to Magnus Carlsen’s World Title, with White against the former. Another factor was that Caruana had had an extra day off, due to having been drawn against Ding Liren who had been forced to withdraw after round three. Would the American come out with his sleeves rolled up? Well, answers on a postcard, but it seemed a bit of a tentative start to me, in an English Four Knights. This is not surprising of course, Fabiano will not be wanting to reveal his best preparation until his match against Carlsen in November. Indeed, he had tried to not play this event, but after an amicable chat with the organisers, it was agreed that he would. That being said, this game was only his second White of the tournament and in his first, he had played 1.e4, so perhaps I am barking completely up the wrong tree. However, that game was a quick Petrov with a toothache-inflicted Shakhriyar Mamedyarov, so also perhaps not. Anyway, we will see. I have played the English Opening a great deal in my chess life and I really like it. I can certainly understand why top players bring it out here and there. As well as having some very potent lines, it has good natural and flexible development. This can be very useful if one does not want to get bogged down in theory (not that the English does not have a wealth of that) but just wants to play and see where things go. This is a double-edged-sword, however and can lead to passivity and disorganisation if the player does not at least have some idea of what they want. And that seems to be what was happening in this game, to my eyes a least. Black certainly handled the opening fine. The following diagram shows the position following Caruana’s 14.Qc2. From here, the game continued with 14…e4 15.Nh2 Qg5. And I think this is perhaps where a little delusion of grandeur set in with Karjakin. This move certainly seems inappropriate to me at this stage and does not work out for him. In hindsight, continuing to develop with …Rad8 was probably prudent or even …Nd8 in order to release the c-pawn. However, …Nd8 is a concession that Black wants to avoid. However, in chess, sometimes one just has to do the right thing and it seems that Sergey didn’t, here. The game continued with 16.f4, which was not bad, but perhaps f3 would have been more spicey. The problem with 16.f4 is that Black had 16…Qf5 available. After 17.Rac1 Rad8, White is slightly better and has choices of how to proceed, 18.Bb5/Ng4/Bc4 — he can even play Nf3 if he wants due to the Black e-pawn being pinned to the Queen. Had Carauna opted for 16.f3 instead (see diagram, above), …Qf5 would lose to fxe4 with Bf3 next to any recapture. Actually, having looked at this position a bit, Black’s options seem to be between the lesser of evils: 16…exf3 17.Nf3 Qg3 18.Bd3; 16…f5 17.Bc4; 16…Nf6 17.Bxf6 and if 17…Qxf6 18.fxe4; 16…Nd8 17.Rf2. In short, I think Black would have been uncomfortable. As it was, 16.f4 was played and Karjakin opted for the en-passant capture of 16…exf3ep. There followed 17.Nxf3 Qg3 18.Rf2 Rad8 19.Bc4 Nf6 20.Bxf6 gxf6 21.Raf1. And the consequences of Black’s play up to here were clear to see. It left Caruana able to excert pressure along the f-file as well as on the Queenside. Karjakin was left quite paralysed and able only to shuffle his King for a few moves waiting for the final push from his opponent. He eventually tried counter-attack, giving bishop for two pawns to open up White’s King. It was desperation however and proved futile. Caruana had the point in 41. The other games were drawn, including Carlsen-Anand. In all honesty and with all respect to the players, when the Symmetrical English came out, I already had the feeling that it was not going to be very dramatic and this proved the case. It was a rather controlled affair and as soon as tension threatened, it was dealt with. Liquidation happened steadily but surely and the players repeated and shook hands on move 45. The others were somewhat lesser affairs. Vachier-Lagrave-Aronian was a 25-move Nimzo, beating the Nimzo of Mamedyarov-Nakamura by one. 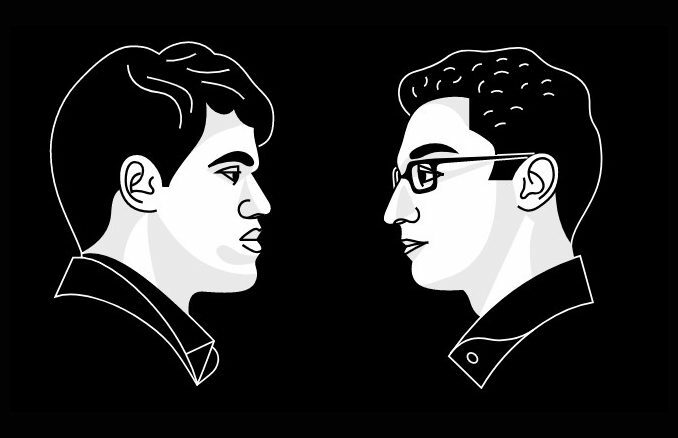 Carlsen ½ vs ½ Anand, Mamedyarov ½ vs ½ Nakamura, Vachier-Lagrave ½ vs ½ Aronian, Caruana 1 vs 0 Karjakin. Aronian vs Caruana, Nakamura vs Vachier-Lagrave, Anand vs Mamedyarov, So vs Carlsen, (Karjakin free).